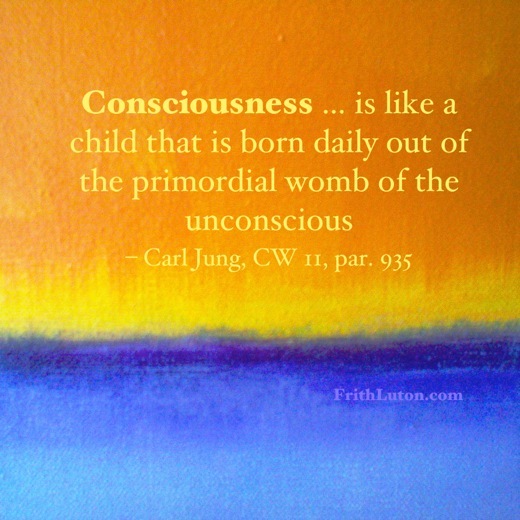 One of Jung’s basic beliefs, and arguably his most important message, is that the purpose of human life is in becoming conscious. “As far as we can discern,” Jung writes, “the sole purpose of human existence is to kindle a light in the darkness of mere being.” – Memories, Dreams, Reflections, p. 326. The “civilised man” tends to live in his head. He prides himself on a rational approach to life, and rightly so. We are no longer apes. Thanks to reason, science and logic, instead of hanging from trees or living in them, we cut them down to build houses, which we then fill with appliances in order to make life easier, or, as it happens, more complicated. All the same, the more we lose touch with our other side, our instinctual base, the more likely it is that something will happen in us to bring about a proper balance. This is the basis for Jung’s idea of compensation within the psyche. One way or another, we’ll be brought down to earth. 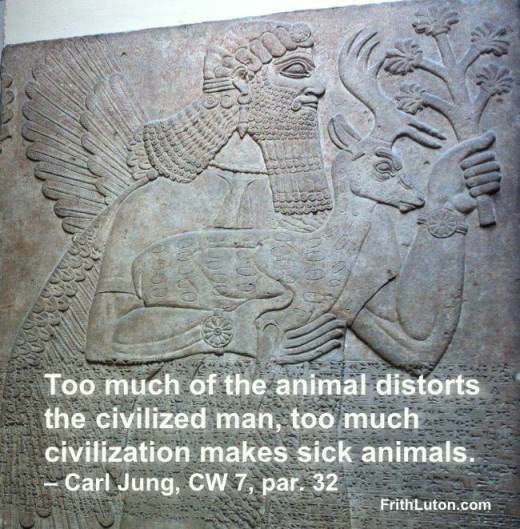 It is just when we think we have everything under control that we are most apt to fall on our face, and this is especially true when we don’t reckon with the uncivilised, ten-million-year-old animal in us. That being said, unexamined instinctual behaviour is a hallmark of unconsciousness and a notable characteristic of the undeveloped personality. Through analysis one can become conscious of the instincts and the many ways in which we are slaves to them. But this is not done with a view to giving them boundless freedom. The aim is rather to incorporate them into a purposeful whole. Jung defined consciousness as “the function or activity which maintains the relation of psychic contents to the ego.” [CW 6, par. 700] In that way he distinguished it conceptually from the psyche itself, which is comprised of both consciousness and the unconscious. Also, although we speak of ego-consciousness, in Jung’s model the ego is not the same thing as consciousness, but simply the dominant complex of the conscious mind. Of course, in practice we can only become aware of psychic contents by means of the ego. In other words, the more we know about what’s going on in our unconscious, the more conscious we become. Becoming conscious preeminently involves discriminating between opposites. Since the basic opposites are consciousness and the unconscious, the first hurdle is to acknowledge that there are some things about ourselves we’re not aware of. Those who cannot do this are doomed forever to skim the surface of life. For those who can admit to another side of themselves, there is then the daunting task of discriminating between a whole range of other opposites—thinking and feeling, masculine and feminine, good and evil, and so on. And then there is the crucial difference between inner and outer, oneself and others. 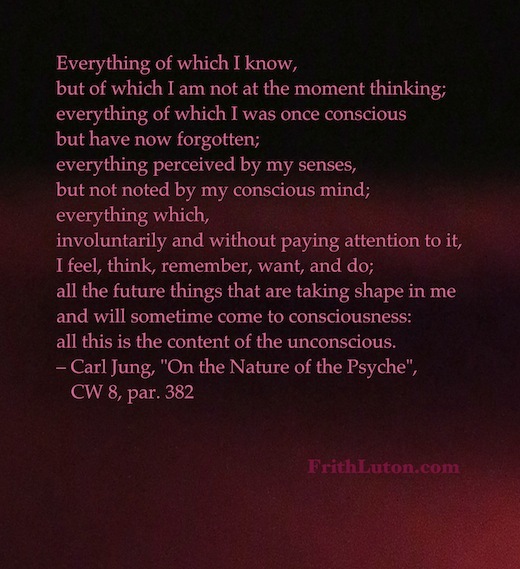 Jung describes two distinct ways in which consciousness is enlarged. One is during a moment of high emotional tension involving a situation in the outer world. We feel uneasy for no obvious reason, or strangely attracted to someone, and suddenly we understand what’s going on. The other way is what happens in a state of quiet contemplation, where ideas pass before the mind’s eye like dream images. Suddenly there is a flash of association between two apparently disconnected and widely separated thoughts. In each case it is the discharge of energy-tension that produces consciousness. These sudden realisations and flashes of insight are what we commonly experience as revelations. A child lives in a state of oneness with its primary care-giver. There is little separation between subject and object. As the growing child assimilates experience and develops personal boundaries—a sense of self separate from the outside world—so the ego comes into being. There is a recognisable sense of personal identity, an “I am.” This goes on in fits and starts, until at some point you have this metaphorical “land-mass of consciousness,” surrounded by the waters of the unconscious. The first half of life generally involves this developmental process. Given decent mirroring in the early years, we stand a good chance of acquiring a healthy ego. But again, this is not the same thing as being conscious. There are lots of take-charge people with very healthy egos—captains of industry, politicians, artists, entrepreneurs and so on—who are quite unconscious. You can be a leader, run things like a clock and manage others well. But if you don’t take the time to introspect, to question who you are without your external trappings, you can’t claim to be conscious. Mature consciousness, according to Jung, is dependent on a working relationship between a strong but flexible ego and the Self, regulating centre of the psyche. For that to happen one has to acknowledge that the ego is not in charge. This is not a natural process; it is a major shift in perspective, like the difference between thinking the earth is the centre of the solar system and then learning that the sun is. This generally doesn’t happen until later in life, when you look back on your experience and realise there was more going on than you knew. Ergo, something other than “you” was pulling the strings. Becoming conscious, then, is above all not a one-time thing. It is a continuous process, by the ego, of assimilating what was previously unknown to the ego. It involves a progressive understanding of why we do what we do. And a major step is to become aware of the many ways we’re influenced by unconscious aspects of ourselves, which is to say, our complexes. And that is why, in spite of our best efforts in becoming conscious, we will all, always, be more or less unconscious. © from Daryl Sharp’s Digesting Jung, reproduced with kind permission of the author.